In 1982 I decided to start my own Engineering Consulting Company after leaving a startup company, Hilevel Technology. The founder of Hilevel and I had a falling out, and I did not want to go back to working for a large corporation like Burroughs, my former employer or for anyone else. 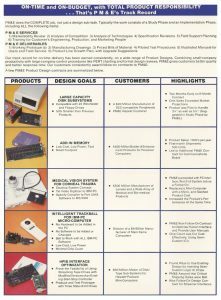 It made sense to me to become a consultant since I did not have the money to start a manufacturing company. I took all my savings and bought an IBM PC with a printer and some needed software. I also printed some marketing information and business cards. In all I spent about $6,000. I needed a name for my consulting company, I talked to Patty about it as she had a good marketing sense, we decided on Pacific Management and Engineering Company. It sounded important, and covered both types of consulting I wanted to do, Management and Engineering, areas I had experience in. The company was one person, and I had to make some money! Before I resigned from Hilevel a friend of mine who was a consultant recommended me for an opportunity with Data Systems Corporation in San Diego. He put in the good word for me, and they gave me the contract to design a tape controller. Data Systems made controllers for DEC (Digital Equipment Corp.) minicomputers. The company being in San Diego required me to commute down there about two or three days a week. 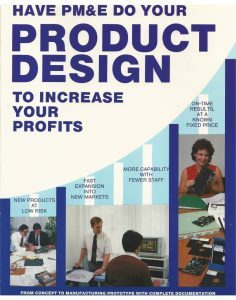 Since I had my own PC I could do design work at home, something new in those days. So from day one I was making money, in fact my consulting income was almost double that of my salary at Hilevel. Even though Patty would be leaving her job as an Accountant at University of California Irvine because we were having our first child David, we could pay the bills. Data Systems gave me a tape controller project. The tape controller project was about three months long, and Data Systems liked the work I did, so they gave me two other projects, a disk controller and a communications controller. They also needed some disk enclosures designed and, even though I was not a mechanical engineer, I said I would get it done. One of the manufacturing engineers I had hired at Hilevel wanted to keep in touch with me and offered to help if I needed it. I called him for a referral on the enclosure, but he said he would design it for me in his free time. We put the thing together in my garage in Mission Viejo in the summer of 1982, so Patty always likes to say we started in the garage, which was true! I began getting jobs with other companies in Orange County, Century Data Systems, a disk manufacturer in Anaheim, Persyst, AST Research, and ALR, PC add-on companies in Irvine (latter to become PC manufacturers). I needed more help! I was also still working out of my house, which would not work as I added employees. I began to subcontract some design work to engineers that I knew, but that was not good because I had little control over them, yet my name was on the project. Wayne King, the owner of American Automation, a microprocessor development system company, called me one day and asked me to come by his office in Tustin. I knew him from the Hilevel days, and had done a little consulting for him after I left Hilevel. I had told Wayne I was looking for an engineer, and he introduced me to Al Pease. Al had not actually worked for Wayne, but had come by looking for a job and Wayne liked him but did not have a position available. I interviewed Al and also liked him; I decided to hire my first employee. Shortly after that, one of the engineers at Data Systems, Bawn McCrea, also called me and asked if I had any openings, he wanted to move to Orange County for personal reasons. Bawn was a young guy, sharp and a hard worker. I found a suite in a business park in Tustin on Parkway Loop, near the intersection of Redhill and Edinger. Early in 1983 we moved in. The place seemed way too big for us, but that was all about to change that winter. One guiding principle I lived by was always make money on projects. I would not underbid just to stay “busy”. I knew I was an excellent engineer and I know I hired excellent people. If a customer could not see that, then it was better to move on. Since I was using my money, not “other people’s money” I always had to make a profit. At this time I also changed the structure of the company. I knew I wanted to do products one day, also I had employees now and I needed to be incorporated. 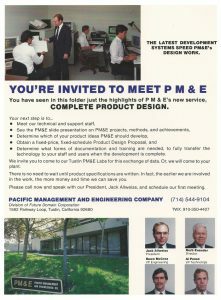 The name PM&E was taken and it was also not a great name for a product company. One evening I went out after work with Bawn for a drink, and we discussed corporate names. I wanted a good name for a product company, but we did not have a product yet! We began scribbling on a napkin. Well, I pointed out; the product will be in the Future, so Future might be a good part of the name. Bawn then said that we could look at the future as our “domain”, thus was born Future Domain. The name was available and we incorporated. The initial directors were I, Bawn, Al, and a former consulting customer who had become a friend, Herb Evander. Herb was a semi-retired engineer. He had worked for Hughes Aircraft, and helped found Shiley Corporation, the mechanical heart valve company founded by Don Shiley in Irvine. About two years before Shiley had been sold to Pfizer and Herb had some time. Herb appreciated my work, and we stayed in touch. When I incorporated the company he volunteered to buy some stock and become a board member. I agreed and he served on our board for seven years. PM&E remained a DBA of Future Domain, and as long as we were a consulting company we operated under that name, waiting for the right product opportunity to come along. The last piece of the puzzle was Patty. She had been doing my accounting and handling my office work while also raising David. With Future Domain’s incorporation she also joined the board of directors. As the consulting company grew she balanced taking care of David with accounting and office tasks, hiring employees as needed so she could continue to juggle the responsibilities of being a business owner, mother, and wife.